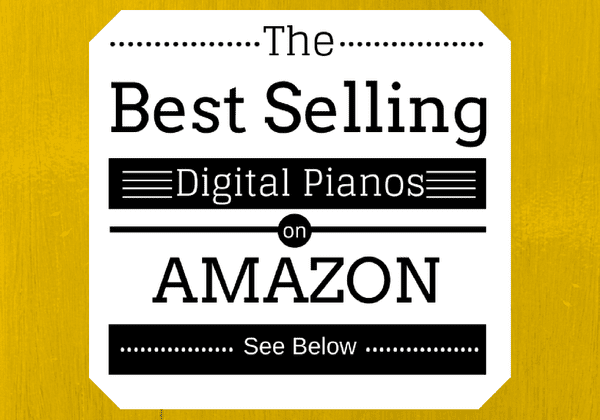 Sometimes you just want the benefits of a great digital piano in a smaller size. And if you fall into that category, then the Yamaha P-121 might just be the piano for you. A lot of times, when we talk about instruments that have less than 88 keys, we often talk about keyboards. The Yamaha NP-12, for example, is a 61-key keyboard. 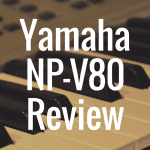 Its big brother, the Yamaha NP-32, jumps up a bit in size to 76-keys. But now, Yamaha has created the P-121, a piano that’s a part of the P-series of pianos but comes in a smaller size and a bit of a reduced price. Essentially a Yamaha P-125 in a smaller piano’s body, the Yamaha P-121 sports just 73-keys, but otherwise mostly provides you with many of the same benefits and features you’d find in the P-125. So, is the P-121 a piano worth your time and money? 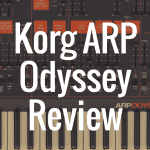 Well, we’re going to dive exactly into that question in this Yamaha P-121 review. And to better help you decide, I encourage you to use the interactive table below, which allows you to directly compare the Yamaha P-121 against other notable digital pianos on the market. So one thing that often happens when you get a keyboard that has less than 88 keys is that you often find the quality of the keybed suffers. You’ll likely feel that the keys feel a best plasticky and cheap, and they simply don’t offer much resistance when you push them down. In short, a keybed with less than 88 keys can sometimes feel like it’s doing a disservice to the job of trying to mimic a real piano. And, that’s of course by design. That’s why it’s so nice to see that the keys on the Yamaha P-121 still mimic the feel of an acoustic piano. That means that these keys are weighted and graded, just as they are on the P-121. For those that may be new to piano, graded keys means that the keys are heavier to the touch on the bottom of the piano, and lighter on the top of the keybed. This is very coveted by pianists, because just like in an acoustic piano, the hammers are heavier in the lower register, for example, in order to hit the bigger strings. The Yamaha P-121 also comes with Graded Hammer Standard action. This is, to be fair, one of the lower actions Yamaha makes (other actions, such as the Graded Hammer, or GH3 or NWX, are superior). 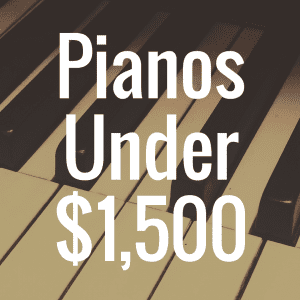 But, remember that the Yamaha P-121 is a piano you can acquire for less than $600. So, for that price, Graded Hammer Standard action is quite nice. The P-121 comes in both satin black and satin white finishes. For an additional price, you can get a stand and pedal unit if you’re planning to have the piano remain stationary in your home. The stand you’d want is the L1 stand, while the pedal unit you’d need is the LP1 triple pedal unit. However, if you need to constantly take the P-121 with you on the go, you can take comfort in knowing that it only weighs 22 pounds. Compare that to the P-125, which weighs 26 lbs. You wouldn’t, on the surface, think that an additional four pounds would make much of a difference. But, try putting a four to five pound weight in your backpack or purse and carry it around with you for a day. I promise you’ll feel a difference in your energy level as the day progresses. The P-121 comes with two speakers with 7 watt amplifiers. Sure, that’s not the strongest sound in the world, but again, for the price range, it’s certainly adequate. You also get 4-layer grand piano samples on the P-121. On top of that, you’ll be able to enjoy 20 rhythms, such as pop, latin, rock and even holidays. There are 21 demo songs in total, as well as 50 piano songs. You get classic songs from the 60s to the 80s on the P-121, as well. If you’re a beginner, or just a pianist that likes to have fun, you can take comfort in knowing that you get a healthy 24 voices here. This allows you to play around with Fender Rhodes and Wurlitzer piano sounds. On top of that, you get things like a jazz organ sound, orchestra strings, choir sounds and much more. Like many pianos these days, the P-121 does indeed come with a 2-track recorder, so you can record your musical masterpieces and share them with your friends and family. One nice feature in the P-121 is rhythm patterns. In short, this piano features on-board drum and bass tracks. And they will keep playing and follow along with your harmony. So, essentially, as you play, a bass track will play underneath your music. This is awesome for practicing or just playing around on the piano. But deeper than that, it’s especially helpful if you want to get the feel for what it’d be like to play in a band—even if you’re just sitting in your room playing by yourself. So that’s a very nice feature that can double as being both fun and helpful to your piano playing growth. A digital piano is such a fantastic instrument when you compare it to its acoustic cousin. It can utilize technology in a way to better teach you how to play the piano, or help you improve your skill. While an acoustic piano has its advantages, its major disadvantage (aside from size, heft, and the need for tuning) is that its creativity is limited by it being a traditional instrument. Despite the Yamaha P-121 having just 73 keys, it comes with a lot of cool functions. One feature you get here is split mode, which you may already be familiar with. For those that aren’t, the split function does, well, exactly what it sounds like—it allows you to split the keyboard essentially in half, allowing for the left hand to play one sound and the right hand to play another sound. This can be very useful if, for example, you want to have the left hand play the bass and the right hand control strings or piano or an organ sound. On top of that, the P-121 allows you to layer two voices together. Therefore, you could take a grand piano sound, for example, and layer it with an orchestra sound if your goal was to get emotionally swelling music that would be positively perfect for a romantic or sentimental scene in a feature film. The Yamaha P-121 also comes with Duo Mode, as well. In this mode, you can split the keyboard and have two middle C’s. 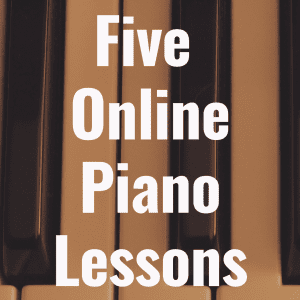 This is particularly helpful, for example, when you or someone you know needs some additional help on the piano when it comes to perfecting their piano playing skills. What this Duo Mode function allows you to do is have a student on the left side or left register, and the student’s teacher on the right side or upper register. And now, you have two people essentially playing on the same keys, but in different registers. It doesn’t quite stop there, however. Because if you pick up the LP1 pedal unit that I mentioned before, the left pedal (when using Duo Mode) will serve as the sustain pedal for the lower register (or the person utilizing the left side of the piano) and the far right pedal will serve as the sustain pedal for the upper register (or the person sitting on the right side of the piano). Again, this is exactly what you want technology to be able to do—allow you to uniquely learn in multiple ways at your own pace. Okay, now let’s quickly discuss the connectivity options for the P-121. You have quite a few options here in the back of the piano, which is of course quite nice. So first, you get a main input port for plugging in your piano. Next to that is the audio left and right ports, which are quarter inch jacks. Next to that is the port for the triple pedal unit. This is where you’d plug in the LP1 pedal unit, if you chose to buy it separately. The LP1 unit is made by Yamaha. Next to that is where you’ll find the sustain pedal port. And next to that is the USB to HOST port, which of course will allow you to connect your Yamaha P-121 to a computer or even an iPad (which we’ll discuss next). The Yamaha P-121 can also work very well with Yamaha’s Smart Pianist App. This app is fantastic because you can take your iPhone or iPad and, essentially, control all of the features built inside the piano right on your device’s screen. That means that you’d be able to plug in your phone or tablet and control the P-121’s voices, record tracks, and even play some of your favorite songs and have the chords display on the screen in real time, allowing you to play along to your favorite tune as the chords appear on your device. This feature in particular is called Chord Chart. And while it won’t work for every single song on your device, you can check out the official website to find out what kind of songs are most likely to work with this very unique feature of the app. Since we talked about connectivity in the previous section, I’d like to quickly tell you how you can get this app to work with your piano. While of course you need to go to the Apple Store to download the app, the other thing you’ll need to do is get your apple camera connection kit, and connect that to a standard USB cable.From there, you connect the other end of the USB cable to the back of your P-121. Some people may wonder why this all can’t work wirelessly or just via bluetooth. And the reality is that, more likely than not, a full wireless connection would cause a delay in the audio’s response time, thus throwing off your rhythm while you’re playing and ultimately ruining the entire point of the app being a help aid to the pianist. 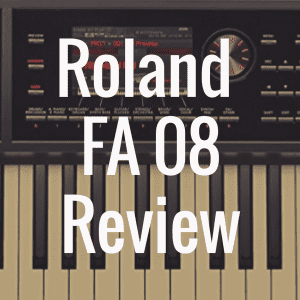 So, in a lot of my reviews, we get to the part where we compare one piano to another piano, or perhaps a new piano to its predecessor, and I begin listing all the key differences. Perhaps the sound or tone generation is better or worse in one instrument or the other. Or maybe the polyphony count has increased. Or maybe there are more songs. Or less voices. But the reality is, none of these differences really exist when we’re talking about the Yamaha P-121 and P-125. The Yamaha P-121 is a smaller, lighter version of the Yamaha P-125. You get the same tone generation (Pure CF). The same polyphony count (192). And the same amount of voices (24). 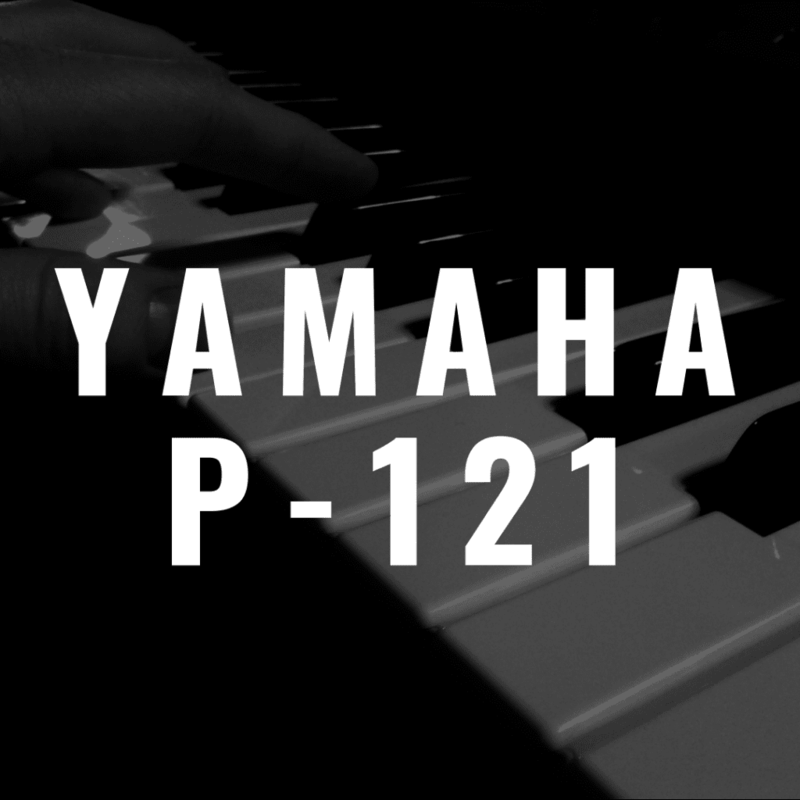 And so, if you’re somebody that needs a lighter piano, doesn’t mind playing on less keys, and wants to save a few dollars (and maybe put that money towards a stand accessory or a triple pedal unit), you’ll likely want to opt for the Yamaha P-121. The Yamaha P-121 is a pretty awesome feat. It’s a nice digital piano that’s a step up from entry level keyboards like the Yamaha NP-12 or Yamaha NP-32. It comes with everything you can expect to get in the Yamaha P-125, but weighs a bit less and saves you almost five pounds of weight on your back. Normally, I would almost always recommend you get 88 weighted keys in a piano. With that said, if you travel a lot from gig to gig and want a more lightweight instrument, or you simply want to save a little money now and possibly graduate to 88 keys later down the road, there’s a very good chance that you’ll be satisfied with the Yamaha P-121. 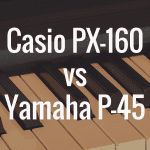 Casio PX-160 vs Yamaha P-45: Which is Better?